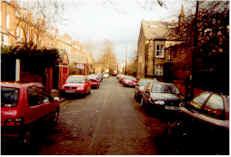 My family lives in a semi-detached town house, half a mile from the famous Headingley cricket ground. We have a posh tree-lined front road, and a back street where we keep the bins. Although we own our bit of the front road, neither we, nor our neighbours, spend much time looking after it. The original Macadam surface disappeared long ago, and the narrow gate at one end makes a bumpy and tricky approach, as paint scrapings on the gateposts testify. Nor is it any easier for walkers. The path is punctuated with the sockets of stolen flagstones, the road is muddy in the rain, and the street lighting is dim. Now and then the residents discuss road repairs, but we rarely agree to do much more than fill a pothole or two. Our back street is very different. It has been adopted by the council and is regularly resurfaced, and brightly lit, with a brand new street sign at both ends. Although the flagstones still get stolen, the council replaces them quickly with tarmac, so the path is safe to walk on. Surely, this shows that roads are a job for governments. Not so fast! Although both streets join the same two minor roads, a steady trickle of rat running commuters use the adopted one each morning. Children are at risk every time they step out between parked cars on their way to school and some residents have asked the council to install sleeping policemen or traffic calming artificial chicanes. Not me. We don’t need traffic calming on our front road, the potholes and narrow entrance do the job, and our children can play safely there all day. We even have an annual bonfire on it, which we leave to burn overnight and on which the younger children toast marshmallows the next morning. If the council would leave our back street alone the children would be equally safe there. The advantages of private owners spending less than the council on sidestreets are not confined to safety. England is slowly being covered in tarmac and residential roads add up to thousands of square miles of the stuff. Tarmac not laid is energy saved. Grass allowed to grow is not just nice to look at, but a habitat for animals. My early rising neighbour has twice come across small deer on our unsurfaced road, but only ever seen urban foxes on the adopted one. Urban light pollution is another important problem, and our dimly lit front road not only gives us the best vantage point to see comets and eclipses ourselves, but contributes in a small way to reducing the annoyance for real astronomers. Even our argumentative street meetings help us get to know our neighbours. Of course there are trade-offs. The dim lighting may encourage crime. Potholes damage car suspensions. The point is not to dispute this, but to argue that ownership by the residents allows those most affected to make the trade-offs for themselves. Individuals can install their own intruder-activated lights if they wish. As a group we could wait for potholes to form, or install traffic calming ourselves. Some residents groups might even put gates at one or both ends of their streets. Others might take the opposite approach and charge commuter tolls. If surrounding streets had closed off key routes, the profits might induce others to compete to provide the best rat runs, although I hope they would soon come up with a less derogatory name. Many different communities owning their own roads would discover systems I cannot imagine. If they were successful new arrivals would be keen to join them. House prices would be a sensitive sign of popular policies and a powerful incentive for owners. Residents committees would respond better to people’s wishes than any local council. The process will start small with individual streets petitioning their local council to return them to the residents. Politicians will hate to give up power, especially as part of the benefit to residents will be a reduced community charge. They’ll demand unanimity, which will be easier in smaller streets. The first task is to get a list of interested streets from which we can select some test cases. After a few successes the process will get easier. I’m confident that this iGreen movement’s time has come. Join me if you agree. Even if you get your shoes muddy, it’ll be worth it. Email me if you’d like to have a go. “In Darlington around 1950, the arrangement was just as you describe – the front street was unadopted and potholed and the beck ran just below it, or over it in very wet weather. In my memory the potholes were always water filled, and all the delivery men used horse and cart, with the housewives lurking at the front gates, shovel at the ready. The back road was metalled and had lorries and cars, and mysterious (to a 5-year-old) businesses, including ice making! And there was definitely a community spirit – I remember only one house had a telly when the coronation happened – the whole street crowded into their front room! It’s interesting that this post links to one on Larkin. I made the same connection. Specifically “Going, going”, I’m sure you know it, if not, well, it’s a delight. Oh yes. A superb poem. Larkin at his grumpy best!